Drain (and set aside) the clam juice from the minced clams. You’ll need about 3 cups of liquid. If you need more, add bottled clam juice to equal 3 cups. Wash the potatoes. Place in a pot, cover with water and bring to a boil. Cook until easily pierced with a fork. Drain and allow to cool. Dice, and set aside. Meanwhile, place the half & half in a large saucepan. Add the clams and bay leaf. Heat, over medium-low heat, until you start to see steam. Turn off the heat and set aside. While the potatoes are cooking, in a large stockpot, brown the bacon over medium heat until brown but not crispy (about 7 – 8 minutes.) Add the butter, and let it melt. Give the bottom of the pot a good scraping to get the good bits off. Add the onion and celery. Scrape the bottom again as necessary. Cook, stirring occasionally, until the onions are translucent, about 5 – 7 minutes. Reduce the heat to low, add the flour and stir/cook until all the vegetables are coated and the mixture starts to thicken (about 1 minute). Add the clam juice, about a cup at a time, stirring as you do. Scrape the bottom as necessary. Add the thyme, salt and pepper. Increase the heat to medium-high, bring to a soft boil, and then reduce heat to a simmer and cook for about 10 minutes. Meanwhile, cook the corn on the cob (click here to see our favorite way). Cool and shave/cut the kernels from the cob. Remove the bay leave from the cream mixture. Add the cream/clams to the soup base. Add the potatoes and corn, and stir in 2 tablespoons of sherry. Bring to a simmer and cook for 5 – 10 minutes. To serve, spoon into individual bowls. Add about 1/2 teaspoon of sherry onto each serving (to float on top) and sprinkle with parsley. 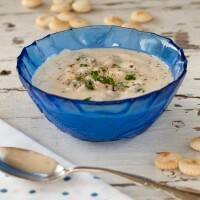 Serve the New England Clam Chowder with oyster crackers and/or toasted and buttered baguette. *Note: You can also use fresh clams for this recipe (add about 15 minutes of prep time). First, scrub and steam the clams. Then mince them. Depending on how many clams you have, you may have to add some canned clams. (You’ll need about 2 cups of minced clams.) Then, use bottled clam juice. Anne, the addition of fresh crab sounds WONDERFUL! Thanks for sharing your version of the chowder. your recipe for clam chowder is wonderful. I worked with a chef once that used the water or oil from canned tuna in their clam chowder and it was great. I have a plastic bag in freezer that I put it in until enough for soup. I use the water. Thanks for the comment! I’ve never heard of using tuna oil/water before. I may have to try that next time.